A camera riding on the world's first deep space solar sail has caught managed to observe a violent gamma-ray burst — one of the most powerful explosions inthe universe, Japanese space officials have announced. TheIkarossolar sail detected the first gamma-ray burst with its onboard GAmma-rayburst Polarized light detector (GAP) on July 7, Japan Aerospace Exploration Agency(JAXA) said in an announcement. Gamma-raybursts are the dying explosion of large stars that have run out of fuel.The collapsing star cores can form either black holes or neutron stars, andemit an intense burst of high-energy gamma-rays. Thesegamma-ray bursts, as they're called, are some of the brightestexplosions in space. One gamma-ray burst, which was observed by NASA'sSwift satellite June 21, was so powerful and bright that it temporarily blindedthe space observatory, NASA officials said. Satellites in space routinely keep watch for powerful gamma-ray bursts, but the GAP instrument on Ikaros is designed to make the first-ever detection of polarized light from the cosmic explosions. "Polarizedlight observations will contribute to elucidate the magnetic structure and theradiation mechanism of gamma-ray bursts, thus they are expected to greatly helpsolve the mystery of the death of massive stars and the birth of blackholes," JAXA officials said. 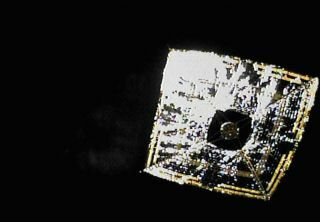 TheGAP can detect gamma-rays coming toward Ikaros from all directions, but canonly carry out its polarized light analysis when the gamma-rays come in fromthe backside of the solar sail. The first gamma-ray burst detected did notallow for such an analysis. Japan'sIkaros solarsail has months of sailing ahead, and scientists calculate that about 20percent of gamma-ray bursts observed by GAP should allow for polarized lightobservations. Thesolar sail launched in May alongside the Venus-bound orbiter Akatsuki. Itachieved a world first by deploying its solar sail in June, and then became thefirst space vehicle to harness sunlightfor propulsion in deep space. ButJAXA scientists hope that the solar sail technology demonstration may alsoyield new findings about gamma-ray bursts. Ikarosrecently represented the toast of the town at a three-day solar sail symposiumheld in New York City this week that ends today.